I start with cutting up the cauliflower into bite-sized pieces. 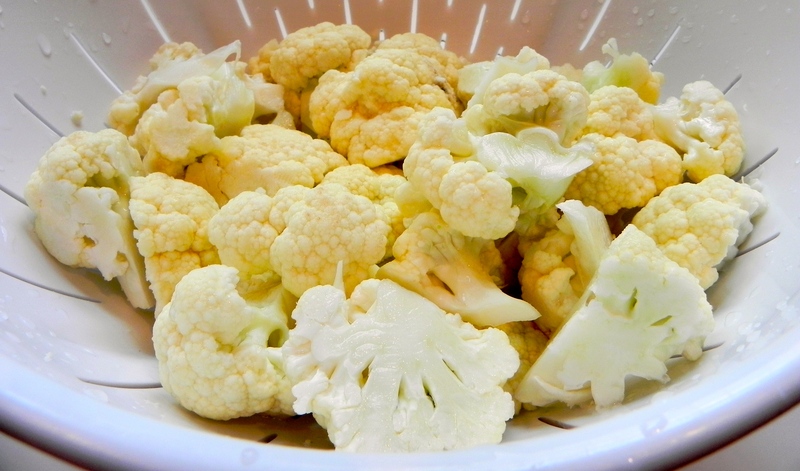 Whenever I cut cauliflower, it ends up flying everywhere so I seriously do not like doing it. Then I make the batter for dipping the cauliflower. It is a pretty simple combination of flour, cornmeal, soy sauce and some spices. I pan fry the pieces (you could deep-fry them but I wanted to be slightly healthier) in vegetable oil. Then I start the sauce. I used onion and garlic as the base and then add soy sauce and vegetable broth with some other spices. 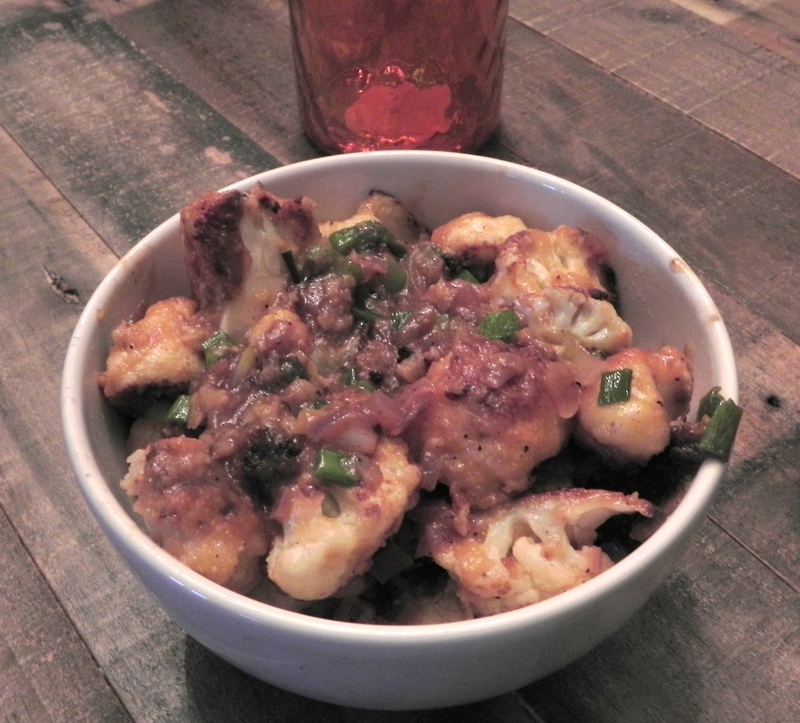 After letting the sauce simmer for about 10 minutes, I add the cauliflower and green onions.The final product tasted pretty close to the Indian-Chinese I have had at restaurants which I would say means it was a success! Its also not very hard to put together which is a plus. We ate it with leftover Indian food we ordered from the weekend and it was a perfect addition to the meal. To make the batter: in a large bowl, mix the flour and corn meal. Add the soy sauce, ginger garlic paste and other spices to the bowl and mix well. Add about a half cup of water to the batter and mix in. Add more water as needed so the batter thins out but make sure it doesn’t get too soupy. 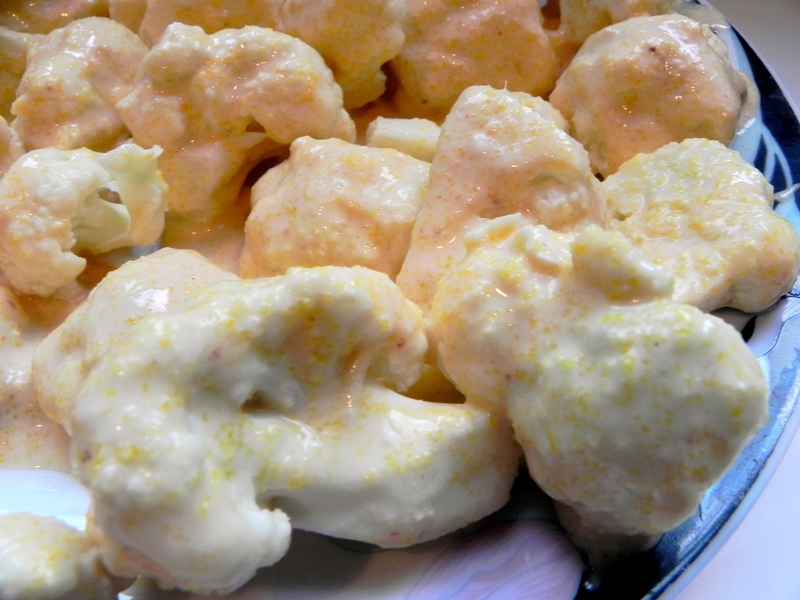 Dip each cauliflower piece into the batter to coat. Pour the vegetable oil in a frying pan. 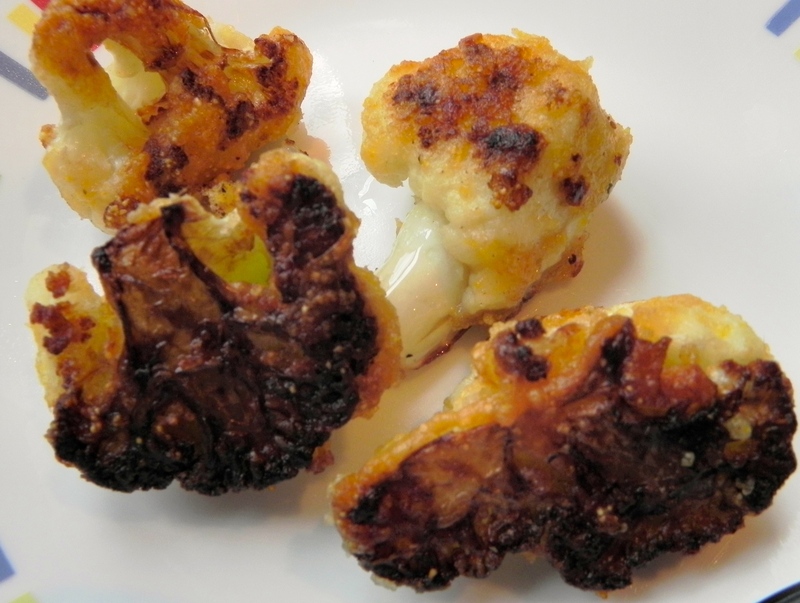 Pan fry the cauliflower florets on medium-high heat until they become dark brown all over (3-5 minutes). Set aside. 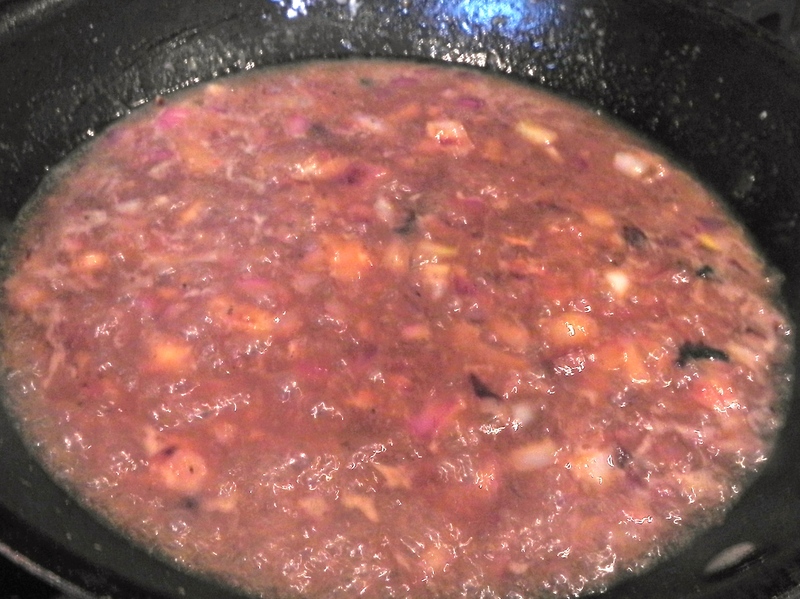 In a frying pan, saute the red onion and garlic for a few minutes on medium heat with a little bit of oil. Add the ginger garlic paste and continue to saute. Add the soy sauce and spices and combine. Then add in the vegetable broth. Let the sauce come to a boil before turning down the heat. Mix in the corn starch to thicken the sauce. Stir and let simmer for 5 minutes. 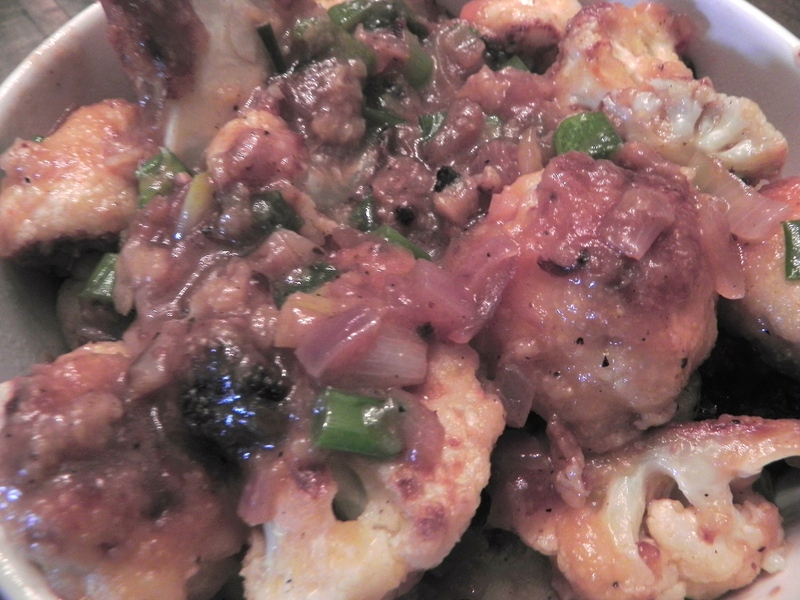 Add the cauliflower and green onion and mix into the sauce. Let it heat through for a few minutes. So psyched to make this!!! Been waiting for the recipe Will be make for Jassis birthday Shhhh! This looks really so good!! Do you think it would be possible to not use dough (as I eat gluten free) and to just season the cauliflower and fry? Might not be getting crispy enough, right? Thanks Neha!! I am SO glad the recipe went well! !